J. Hartle, S.W. Hawking and T. Hertog, The No-Boundary Measure in the Regime of Eternal Inflation, Phys. Rev. D 82 (2010) 063510 [arXiv:1001.0262] [INSPIRE]. V. Balasubramanian, J. de Boer and D. Minic, Mass, entropy and holography in asymptotically de Sitter spaces, Phys. Rev. D 65 (2002) 123508 [hep-th/0110108] [INSPIRE]. J.B. Hartle, S.W. Hawking and T. Hertog, The Classical Universes of the No-Boundary Quantum State, Phys. Rev. D 77 (2008) 123537 [arXiv:0803.1663] [INSPIRE]. J.M. Maldacena, Non-Gaussian features of primordial fluctuations in single field inflationary models, JHEP 05 (2003) 013 [astro-ph/0210603] [INSPIRE]. P. McFadden and K. Skenderis, Holography for Cosmology, Phys. Rev. D 81 (2010) 021301 [arXiv:0907.5542] [INSPIRE]. 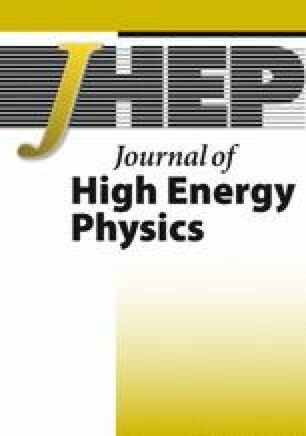 N. Afshordi, C. Corianò, L. Delle Rose, E. Gould and K. Skenderis, From Planck data to Planck era: Observational tests of Holographic Cosmology, Phys. Rev. Lett. 118 (2017) 041301 [arXiv:1607.04878] [INSPIRE]. J. Maldacena, Vacuum decay into Anti de Sitter space, arXiv:1012.0274 [INSPIRE]. S. Fischetti and T. Wiseman, On universality of holographic results for (2 + 1)-dimensional CFTs on curved spacetimes, JHEP 12 (2017) 133 [arXiv:1707.03825] [INSPIRE]. D. Anninos, F. Denef and D. Harlow, Wave function of Vasiliev’s universe: A few slices thereof, Phys. Rev. D 88 (2013) 084049 [arXiv:1207.5517] [INSPIRE]. G. Conti, T. Hertog and Y. Vreys, Squashed Holography with Scalar Condensates, arXiv:1707.09663 [INSPIRE].